The latest outlooks from the the National Oceanic and Atmospheric Administration’s Climate Prediction Center forecast a greater than 40% chance of a warmer than average winter across much of the Southern United States during December 2010 through February 2011. 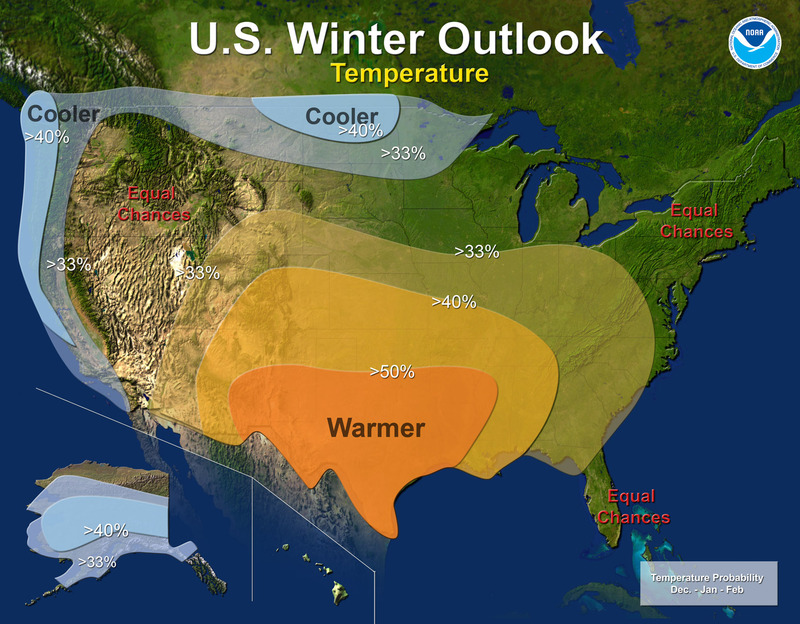 The highest chances for a warmer than average winter are indicated for much of Texas, as well as western Louisiana. The ongoing La Niña is the dominant climate signal driving this winter outlook. La Niña is a condition associated with cooler than average water temperatures in the equatorial Pacific, which tends to be associated with warmer winters in the Southern U.S.
A forecast for a greater chance of a warmer winter in our region does not mean cold air or wintery precipitation will avoid the South this winter; even if the forecast proves to be true. The outlook represents the overall average of the 3-month winter season, which could very well have periods of cold weather mixed in. Regarding the precipitation outlook, forecasted conditions are mixed across the region. A significant portion of the region is anticipated to have a slightly above average chance of drier than normal conditions, especially across central and southern Texas and along the Gulf Coast. A greater than 33% chance of wetter than normal conditions is forecasted for eastern portions of Arkansas and western Tennessee. The precipitation forecast is also based significantly on the La Niña conditions, which are expected to persist through winter. La Niña winters tend to bring a more variable subtropical jet stream, which cuts down on the amount of precipitation that falls throughout much of the region (particularly the South). Jet streams in the atmosphere are like highways for storm systems, so their location is a major factor in determining areas that will and will not receive precipitation, particularly in the winter. Again, keep in mind that these outlooks are a guide based on major climate signals such as La Niña. 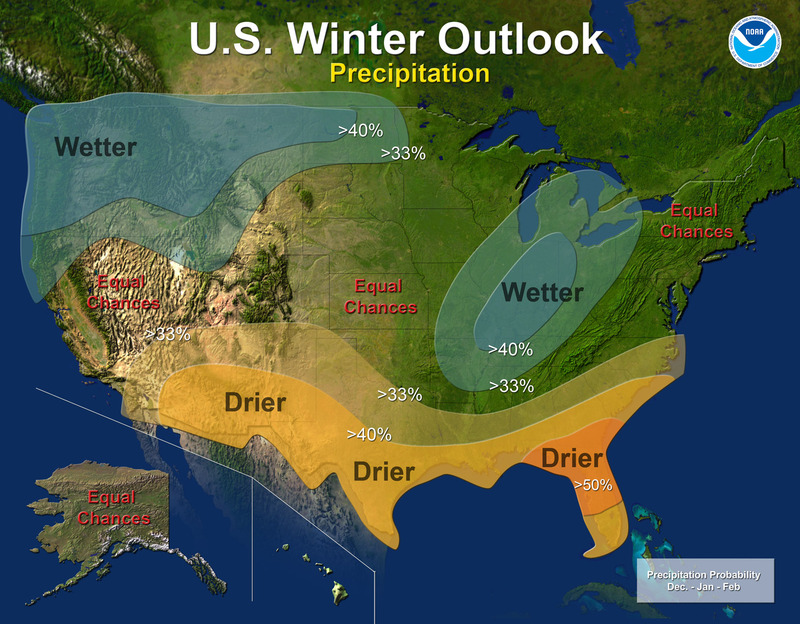 A forecast for a warmer than average winter for the South does not mean no winter storms. In fact, the last La Niña winter (Dec 2007 - Feb 2008) brought with it several major ice storms to the South, including a major disaster declaration throughout much of Oklahoma including the Oklahoma City and Tulsa metropolitan areas during December 2007. It only takes one major outbreak of cold air combined with precipitation to create a major winter storm. Perhaps most significant for the South this winter is the potential for continued and worsening drought conditions in light of the drier than normal precipitation forecast. This raises the potential for wildfire concerns this winter into the spring, particularly in drought-stricken areas. For any questions about this forecast, feel free to contact the Southern Climate Impacts Planning Program at scipp@mesonet.org. And to see the full National Oceanic and Atmospheric Administration press release on the winter outlook, please click here.